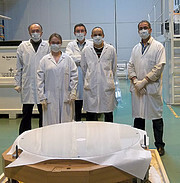 A remarkable thin-shell mirror for ESO’s Very Large Telescope has been delivered by the French company SAGEM. It is 1120 millimetres across but just 2 millimetres thick, making this mirror much thinner than most glass windows. This mirror has to be thin enough to act almost like a flexible film. When installed in the telescope the shape of its reflective surface will be constantly changed by tiny amounts to correct for the blurring effects of the Earth’s atmosphere and create much sharper images. The shell mirror is a sheet of ceramic material that has been polished to a very accurate shape. The manufacturing process starts with a block of Zerodur ceramic, provided by Schott Glass (Germany) that is more than 70 millimetres thick. Most of this material is ground away to create the final thin shell. The challenge is to apply very little pressure and low levels of stress to the glass throughout the manufacturing process. 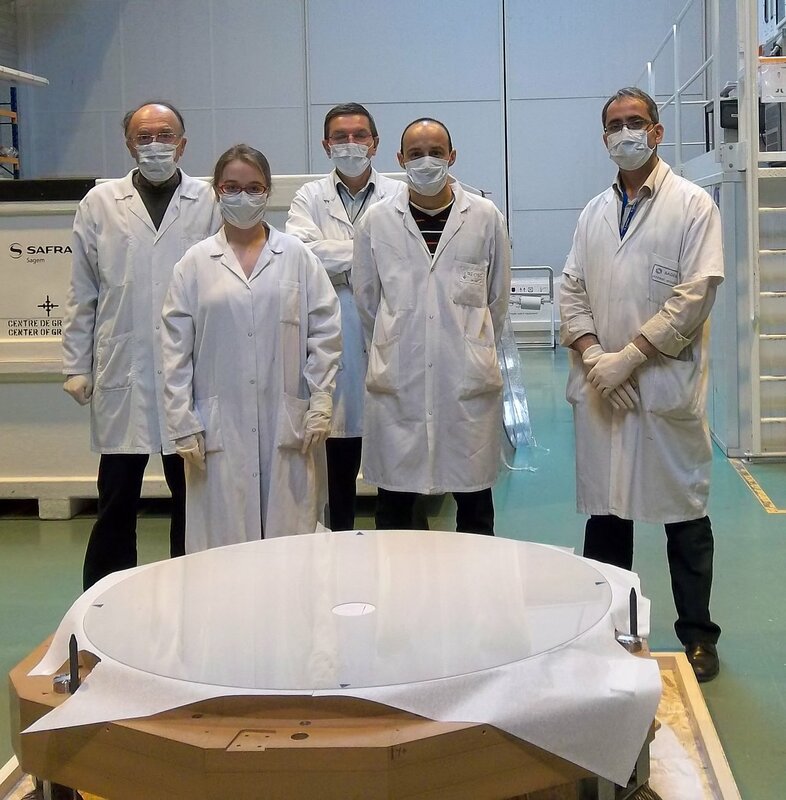 Making and testing such a large but flexible mirror is a huge challenge, but SAGEM has succeeded by carefully controlling the risks of the manufacturing process and has delivered a thin shell that satisfies ESO’s requirements. The new mirror is a major component of the deformable secondary mirror that will replace the current secondary in one of the VLT’s four Unit Telescopes. This forms part of the new Adaptive Optics Facility for the VLT. The entire secondary is built around a rigid “reference body” (ann1056) and includes a set of 1170 actuators that apply a force on 1170 magnets glued to the back face of the thin shell. The shape of the reflecting surface of the thin-shell mirror will be deformed up to a thousand times per second by the action of these actuators to correct for the effects of turbulence in the Earth’s atmosphere and deliver much improved and sharper images. The Adaptive Optics Facility will also make use of laser guide star technology that is being developed in parallel (ann12012). 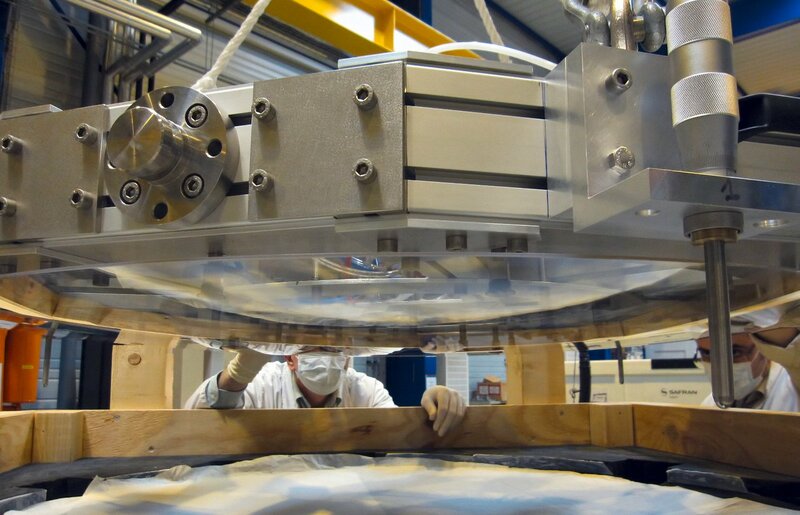 Since 2004, ESO, with the help of the European Commission, has been financing efforts to develop the know-how for the manufacture of thin-shell mirrors in Europe. ESO is delighted to see these efforts bear fruit, thanks to the competence and determination of SAGEM. The new thin-shell mirror, and the adaptive optics system that it forms part of, is paving the way for ESO’s next project: the European Extremely Large Telescope (E-ELT). This work is driving forward progress on advanced technologies such as deformable mirrors with a large number of actuators and the manufacture of thin-shell mirrors. These technologies are directly applicable to the huge 40-metre-class future telescope and the E-ELT design already includes a 2.4-metre thin-shell deformable mirror largely inspired by the Adaptive Optics Facility deformable mirror.